What do you need to know about me for this story? How old I am? how much I earn a year? what kind of car I drive? Look at me now, here I am at the beginning, the middle and the end all at once, in love with someone I can’t have. The waking thought of her, sunlit and new, then the endless all-dayhopeful lightheadedness, and behind it all, dull as a blown-out lightbulb, the fact of the word never. I see someone in the mirror in the hall. I look again. It is me. It is the first time I have seen myself for days and I look as if I have been sleeping in my clothes. I go into the kitchen and I see how the piled-up dishes are coated in rot. I can’t remember eating off any of them. I come through to the living room; the books are all over the floor. I go out into the garden and I look at the apple tree. It is a new apple tree, I planted it three years ago. It is the same height as me. In its first year it gave one apple, edible, sharp-tasting and good. In its second it gave three. This year it is covered in small coming apples; there are more than ten. But its new leaves seem to be dying. When I look closer I see that the shoots on the branches are crowded with green and mauve aphids. The larger new leaves, the fronts of which look clear and clean, have insects packed like bricks on their undersides and the edges of several leaves have been rolled firmly in on themselves, which is killing them. When I uncurl them I find scenes of tiny grime, as if each rolled leaf holds inside it its own abandoned factory yard. All around its base, going up and down the trunk of the young tree, balanced at the very ends of the branches picking at the crammed-in aphids and the sweet tight newest possibilities of leaf :ants. Though I can’t talk for long, my friend says, it’s near London now and the tunnels start soon. No, listen, I’m fine, I say. Really I am. Really good. Except that I wanted to ask you, there are these ants all over the apple tree and hundreds of greenfly on the leaves. Monastery? Coma? Sulk? Whichever, her voice is gone. I hang up the phone, step over the books on the floor in the living room and go back out into the garden. I go straight to the tree and I find a branch with an ant probing its end. I lift the branch to my face until the ant is so close it has gone out of focus. It is unaware of me, of everything but the end of the branch which I hold to my mouth like a tannoy microphone. Please leave, I say. This is my apple tree and you’re killing the leaves. Please tell the other ants to leave with you. Doing some gardening? my neighbour asks across the fence. What he really means and isn’t saying is:why are you at home again in the middle of the afternoon and not at your work? You’re home early, I say. Day off, he says. What about you? Not well? What he means is:have you been made redundant? have you been fired? am I earning more than you now? will you still be able to afford the mortgage or will you have to sell your house? and how much will it be worth, because probably mine will be worth more since I’ve done more to improve mine than you have. No no, I’m fine, I say. I tell him I’m on extended leave. Know anything about ants? I say. Ants? he says. Got to kill them. It’s the only way. Otherwise they spread all over. What he means is :they’d better not spread into my garden. He gets his mower out of his shed, mows his lawn though he only mowed it three days ago, then puts his mower away again. What he means is :you don’t mow your lawn enough. Look at your garden. Look at it, for God’s sake. He goes indoors; I hear the slam of his back door. I have been waiting by the tree now for about half an hour. The ants don’t seem to be doing anything different. They certainly don’t seem to be leaving. I get the old bike out of the shed and I cycle it to the shopping complex and all the way there I am thinking about the skin on the underside of her arm and what it would feel like, and imagining the curve and weight of her breast as it rises over my mouth, past my eyes, so that when I get to the arcade I go into the supermarket because it’s the shop I usually go into, rather than the diy shop which is where I meant to go. I stand in the middle of the fruit and vegetable aisle and I have no idea why I’m here. A trainee is stacking nectarines. She looks about fifteen. Her name badge says angela here to help. I tell Angela about the ants. She looks at me as if she has never heard anything stranger in all her life. She looks at my clothes and at my hair. She backs away. After a few minutes a woman of about thirty comes towards me. Her badge says helen sellar supervisor. I tell her about the ants. Chilli powder, she says. An ant won’t ever walk over chilli powder. They don’t like getting it on their legs. I go to the spice aisle and I buy four packets of mild chilli powder. I buy mild rather than strong because I am concerned not to hurt the ants too much. Angela and Helen Sellar watch me pay and watch me leave; they are still watching me as I unlock my bike from the window at the front of the shop. When I get back to the garden I set up a border round the tree with the contents of two of the packets. The ants continue up and down and under the tree across the orange of the powder as if it isn’t there, as if it’s just so much more earth. I go into the house and phone my father. I’m watching the football, he says. Don’t hang up, I shout. I call him straight back again. The phone rings for a long time. What? he says when he picks it up. Well, you’ve got to paint your trunk of your tree white. They don’t like white. They never cross white. Not the whole trunk, and not gloss for God’s sake or you’ll damage your tree. Emulsion. Put a ring of white around it, that’ll stop them. I go out to the shed again and I find an old tin of paint. I prise the lid off it with a screwdriver. I can’t find a brush so I use the screwdriver to coat three inches all the way round near the base of the trunk with white. I sit on the grass and wait for the paint to dry. I watch to see that no ants will get stuck in it while it’s wet. I knock an ant off the end of a branch. I pick one off the tree and crush it. I see another running down the trunk and I kill it with my thumb. Several more ants panic on the trunk. I kill as many of them as possible. Then I stop killing them. They can kill the tree if they want. What can I do about it? Nothing. I go indoors and start putting books back on the shelves alphabetically. Later I go out into the garden again and dig round the tree. I dig right down to its roots. Even though this tree has only been here for three years its roots are very firm. I use the spade to slice through them and then with all my strength I lean backwards until I have pulled the tree out of the ground. More figuratively speaking, I am walking along the road one day when out of nowhere I am struck by lightning. The lightning is a freak accident; it is not raining, or even very cloudy, it is a fine day, though the weather has been very hot in the south and cooler in the north and presumably the lightning is something to do with the two fronts meeting. When they meet it is as if someone has hit me across the back of the head with a baseball bat or plugged me into a socket whose power lights up my whole body. I am dazed but I am glowing. I am so bright beneath my clothes that I have to shield my eyes. Light is streaming out of the ends of my sleeves over my hands. I put my hands under me and sit down blinking on the kerb. She stops her car in the middle of the road. She leaves the door of it hanging open and comes over to where I’m sitting. She is lit, she is shining too. She looks like summer. I saw you, I saw it all, she tells me. She describes the sudden light darting out of the sky and tells me how it made direct contact with the back of my head. Sure enough, there is a burnt spot in my hair when I finger my skull and I can still smell the slight high scent of singe. I can tell you her hair is yellow. I can tell you she is around twenty-five. I have no idea what kind of car it is she drives. Days later, weeks later, possibly months, and I am in love with the sky, with the ground, with the bees cavorting in the pollen in the flowerheads. I wake up in love. I fall asleep in love. There are ants on my apple tree, killing its leaves. Let them. I love every single one of them, every single invisible dna footprint they leave on its bark. Good luck to them. I hope their aphids thrive. I am in love with their aphids. I am in love, too, not just with my friend whom I love anyway because she is my friend, but also with my neighbour, and with Angela and Helen Sellar at the supermarket. I am in love with my grouchy father. I come in from the garden and sit in my living room surrounded by books I have heaved off the shelves because otherwise will I ever pick them up and open them again? I open my old Chambers Twentieth Century Dictionary randomly. Everything is meaningful. Gordian:as in Gordian knot. Hylic means corporeal. Need means want of something which one cannot do without; a state that requires relief; necessity; want of the means of living. Spelter is impure zinc. Gleam is a small stream of light, a beam, a brightness, often used figuratively itself, i.e. a gleam of hope, a gleam of understanding. I lie on the floor with my head on my books and my feet up on more of my books and stare up at the ceiling with its flystuck old electric fitting and at this point in the story even the ceiling is glorious. 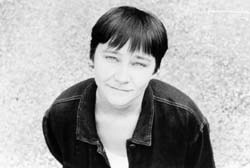 Ali Smith’s latest book, The Accidental, is published by Hamish Hamilton on 26th May 2005, priced £14.99 HBK, ISBN 0241141907.